You can find a wide variety of options for size 14 women's shoes right here. Plenty of online footwear retailers carry popular brands of dress, casual, boots, heels, sandals, and more in larger shoe sizes. Get yourself a great pair of shoes that are not only stylish, but comfortable as well. It's just what you've been hoping for! TALL TIP: Long Tall Sally has a large collection of trendy size 14 shoes that you will want to see. 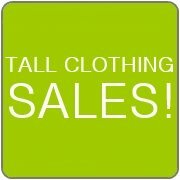 You also get Free Shipping when you buy $30 worth of tall clothing with your shoes! B.A. Mason - Sizes: to 14 | Widths: AAAA – EEEE | Offers an extensive range of regular and hard-to-find shoe sizes and widths, up to size 14 women's shoes. Find casual, dress, sandals, boots, and athletic styles. Friedman's Shoes - Sizes: to 14 | Widths: N – WW | An online retailer specializing in hard-to-find big footwear styles in up to size 14 women's shoes. Find dress, sandals, boots, and fashion heels designs. Maryland Square - Sizes: to 14 | Widths: AAAA – EEEE | Carries more than 800 styles from quality name brands in up to size 14 women's shoes and in a full range of widths. Find casual, dress, sandals, boots, athletic, outdoors, and comfort fit styles. Nordstrom - Sizes: to 14 | Widths: SS – WW | Sophisticated clothing and accessories retailer carrying casual, dress, sandals, boots, fashion heels, and athletic styles in up to size 14 women's shoes. Also offers tall women's designer jeans and pants in up to 36" inseams. ShoeMall - Sizes: to 14 | Widths: AAAA – EEEE | Online retailer focused on providing a large variety of widths and hard-to-find shoe sizes. Find trendy styles including casual, dress, sandals, boots, athletic, outdoors, and comfort fit in up to size 14 women's shoes.